Indigenous tourism is a job creator and nation builder. It has distinct characteristics, with an emphasis on heritage and culture, and aims to improve social and economic circumstances. Market- and export-ready Indigenous tourism experiences are authentic; they aim to preserve and strengthen traditions, customs, and culture and to improve people’s understanding of Indigenous history. Tourism HR Canada, in partnership with the Indigenous Tourism Association of Canada, held an inaugural consultation session with Indigenous leaders and other key stakeholders on October 28 in Saskatoon, on Treaty 6 Territory and the homeland of the Métis. Co-facilitated by Trina Mathers-Simard, Executive Director, Aboriginal Experiences, and Philip Mondor, President and CEO, Tourism HR Canada, the event featured three accomplished Indigenous entrepreneurs who shared their stories. The speakers demonstrated the unique and diverse types of Indigenous tourism offerings. The event is one of 30 sessions to be held over the next two to three years that will define the current landscape of labour needs while identifying future knowledge and skills required of tourism workers. This is the first comprehensive study of this type for the tourism sector in Canada; it will better position the sector to be globally competitive and responsive to growing markets. The project includes dedicated funding to define the unique skills and knowledge specific to Indigenous tourism, which will help ITAC, tourism businesses, and others demonstrate where training dollars must go; it will inform policies and programs and demonstrate the acute need and priority to fund an Indigenous Tourism Labour Market Strategy. The first speaker was Kevin Eshkawkogan, CEO of the Indigenous Tourism Association of Ontario and past CEO of Great Spirit Trail, a tourism company comprising a hotel and conference centre on Manitoulin Island and the Sagamok region in Northeastern Ontario. The Great Spirit Trail offers nature-based and cultural tourism from an Aboriginal perspective, including adventures ranging from relaxing day trips and educational cultural workshops to wilderness eco-adventures via canoe and horseback. And, Kevin underscored the need to invest in ongoing professional development and the continued pursuit of Indigenous knowledge. The second speaker was Kylik Kisoun Taylor, owner and operator of Tundra North Tours, located in Inuvik, Northwest Territories. Tundra North Tours provides authentic Arctic experiences, connecting visitors with the land, cultures, and people of the north. Kylik believes that sharing his way of life and showcasing his culture is a way of preserving it, and that tourism creates jobs and a sustainable economy for Indigenous people throughout Canada, strengthening cultural bonds and an understanding of what it means to be Indigenous. Kylik spoke in-depth on skills and knowledge for Indigenous businesses seeking to attract international markets, and the need for continued professional development and information seeking. The theme of mentoring came up frequently, as did meeting customer expectations. Known for his insightful one-liners, Kylik summed up his views by saying, “It’s all about aligning dreams”, which encapsulated the types of skills and knowledge required of an Indigenous entrepreneur, and the match to meeting visitor expectations. The third speaker was Patricia Dunnett, General Manager, Metepenagiag Heritage Park (MHP), Metepenagiag Mi’kmaq Nation (Red Bank), New Brunswick. MHP is a state-of-the-art facility that celebrates Mi’kmaq culture through music, oral history, exhibits, trail tours of the traditional Mi’kmaq lands, and hands-on cultural activities. The park’s mandate is to preserve, protect, and promote two significant National Historic Sites, the Augustine Mound and the Oxbow, both ancient and historic sites of the Mi’kmaq, dating back more than 3,000 years. In Patricia’s story, community and partnerships factored large. Patricia emphasized skills and knowledge that involved extensive community links, such as the ability to seek and develop meaningful partnerships, and to gain community support and engagement in product development. Like the previous two speakers, Patricia also noted the need for skills on communicating and educating visitors about culture, and skills on product development. Patricia emphasized the way this was achieved: establishing mentorships and additional learning opportunities, building trust, and being resilient and persistent—traits that reinforced the very values embodied by the Indigenous experience. Although this article only hints at a sample of the knowledge and skills discussed, it illustrates the power of storytelling and the richness of experience. The stories also remind us of the vast potential and demand to grow the market—something that can only be achieved with an investment in education and training. A key outcome of the discussions was the agreement that a pan-Canadian Indigenous Tourism Labour Market Strategy is needed. This event was the beginning of the journey to document the experiences of successful Indigenous tourism entrepreneurs. It highlighted that Indigenous tourism is largely about social entrepreneurship and consists not only of economic prosperity, but also includes collective cultural and social identity and wellbeing. Defining the skills and knowledge required is a complex undertaking, and there are unique lessons to learn from those who have created the path, and from elders and other stakeholders. Connor Tenasco, an Indigenous youth, was asked to comment on his reflections of the discussions. He said, “It’s all about the building of respect and helping to enlighten and educate others on the culture and heritage.” He expressed the immense potential and opportunity of Indigenous tourism, and, beyond economic benefits, how it leads to job creation and self-determination. To learn more about this project and future consultation sessions, check out the Future Skills Framework. Tourism HR Canada has released two new demographic summaries examining the workforce in the accommodations and food and beverage industries. These cover businesses ranging from hotels and motels to RV parks and camps, and from full-service restaurants to drinking places. Additionally, the summaries describe industry workforce trends since the 2011 census. Many industry groups saw a rise in total employment numbers, and, much like Canada as a whole, saw an increase in the average worker age, as well as the percentage of immigrant and non-permanent resident workers. The accommodations industry saw its share of workers possessing a bachelor’s degree increase by 3.3% from 2011 to 2016, reflecting the continuing increase in education rates among Canadians. From 2011 to 2016, the share of accommodations workers who mother tongue was not English or French increased by almost 4%. Food and beverage services workers that identified as Indigenous increased by 0.7% between 2011 and 2016. Although food and beverage services accounted for the greatest share of employment in the tourism sector, it has the lowest percentage of employees covered by a collective agreement, at 2.4%. Statistics Canada recently released an updated Provincial and Territorial Tourism Satellite Account (PTTSA). The PTTSA is the only source for comparable data on tourism expenditures in the different regions of Canada. Tourism HR Canada has a long history of involvement with Canada’s tourism satellite account and is happy to see the provincial/territorial version updated to the year 2014. The findings of the PTTSA are available from Statistics Canada’s publication The Daily and users can search the data within the PTTSA online. A national Tourism Satellite Account (TSA) has been produced regularly for some time and is the foundation for the National Tourism Indicators, which provide quarterly information on tourism demand in Canada. However, the economic effect of tourism varies across the country, and this extension of the TSA to cover the provinces and territories allows us to explore this variance. A satellite account for tourism is necessary because a discrete unit called “tourism” does not appear in the systems used to measure economic activity in Canada. The system of national accounts is used to measure economic activity in Canada. It in turn uses the North American Industry Classification system (NAICs), which classifies business establishments by the type of economic activity they are involved in, i.e., the main and goods and services they produce. Tourism, however, is usually defined by the activities of a type of consumer—the tourist. Tourists touch many different industries when they travel, such as transportation services, recreational services, and accommodation, among other forms of discrete economic activity. Although a single industry called “tourism” cannot be found, it implicitly exists within the national accounts because all those industries that tourists use are spread throughout it. By bringing together and analyzing the sub-industries that make up tourism, the PTTSA allows us to measure tourism at the provincial and territorial level. Because the satellite account is based in the system of national accounts, the data it provides is comparable with other sectors or industries. Nationally, tourism activities contributed $35 billion to Canada’s Gross Domestic Product (GDP) in 2014. As a share of provincial/territorial GDP, tourism activities ranged from 1.2% in Nunavut to 3.0% in Prince Edward Island. It is worth noting that the PTTSA reports on the economic activity caused by tourists spending money. But many industries that serve tourists also derive a significant amount of revenue from non-tourists—for example, restaurants, which serve residents as well as tourists. For this reason, data from the TSA is different from data reported elsewhere. For example, Tourism HR Canada usually reports the total number of jobs in tourism—which includes all jobs created by both tourists and locals, whereas the PTTSA reports only those jobs that are caused by tourism activity, i.e., the share of jobs supported by tourists spending money. In September 2018, the unemployment rate1 in the tourism sector was at 4.7%, which is 0.7% higher than the rate reported in September 2017, and lower than the previous month (August 2018), when the unemployment rate stood at 5.1%. At 4.7%, tourism’s unemployment rate was below Canada’s seasonally unadjusted unemployment rate of 5.4%. All tourism industry groups reported higher unemployment rates than the same month last year (Table 1). On a provincial basis, tourism unemployment rates ranged from 2.7% in Prince Edward Island and Saskatchewan to 7.0% in Manitoba. The seasonally unadjusted unemployment rates for tourism in each province, with the exceptions of Quebec, Manitoba, and British Columbia, were below the rates reported for the provincial economy. (Figure 1). Tourism employment comprised 11.6% of the total Canadian labour force for the month of September. 2 As defined by the Canadian Tourism Satellite Account. The NAICS industries included in the tourism sector are those that would cease to exist or operate at a significantly reduced level of activity as a direct result of an absence of tourism. Source: Statistics Canada Labour Force Survey, customized tabulations. Based on data for the week ending September 15, 2018. 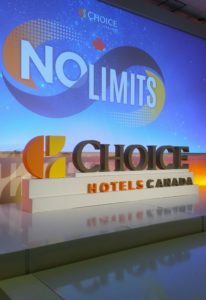 The ongoing shortage of skilled workers dominated conversation as Tourism HR Canada President and CEO Philip Mondor presented the latest labour market intelligence at the Choice Hotels Canada Fall Conference, held October 11 at the Fallsview Casino and Resort, Niagara Falls. For the lunch presentation, Help Wanted: Current Issues and Practical Strategies, Philip shared the most current data on the chronic shortage of workers and its impact on hotels in Canada. Two out of three accommodation businesses report the shortage of workers as a significant impediment, impacting growth, causing staff burnout, and increasing operating costs. These businesses are seeing significant growth and demand for services, but are hampered by a lack of workers. Businesses are also facing a need for increased skills, especially at the management and executive levels. The increasingly tight labour market means growing competition for workers across economic sectors. The dwindling supply of youth, which historically has been a key source of accommodations workers, is leading to a growing need to further diversify the workforce and attract under-represented groups. Studies predict 33% growth in full-time jobs in the hotel industry by 2035, making it attractive for many and different than the trend towards more part-time, casual, and impermanent employment. The lunch presentation was followed up with a working session, Tackling Hospitality’s Labour Shortage: Solutions for Change, on how to address the issues. Attendees explored how the problem could be addressed at various levels, including political/policy, institutional/business, and individual. twelve tips to help employers deal with the problem immediately. For further coverage on these issues and the latest labour market intelligence, subscribe to Tourism HR Insider. For a copy of the full presentation, please email info@tourismhr.ca. Tourism HR Canada is pleased to announce a three-year initiative to address the changing nature of work in the tourism sector, funded by the Government of Canada’s Sectoral Initiatives Program. The Future Skills Framework project will see the creation of a comprehensive and sustainable pan-Canadian competency framework for the tourism economy, representing its five associated industries: accommodations; food and beverage services; transportation; recreation and entertainment; and travel services. The framework will be a dynamic, comprehensive compendium of competencies and essential employability and social skills that will build on the occupational standards Tourism HR Canada has developed and operated with over the past 25 years. Rather than a suite of occupation-specific standards, which can be costly and difficult to maintain, the framework will consist of one library of easily updated competency elements that will define current and future skills in the tourism sector, along with various tools to guide its use. The need for the Future Skills Framework is rooted in the skills gaps and mismatches found across the Canadian labour market, as well as the benefits associated with using competencies in relation to the increasing pace of change in today’s workplaces. The creation of a pan-Canadian tourism competency framework is a progressive and future-oriented initiative to provide a range of stakeholders with a better way to align the skills available within individuals of the Canadian labour market. Over the course of the project, several opportunities for participation will be available. The development and content of the competency framework will greatly benefit from the expertise of those throughout the various tourism industries, as well as those with experience in developing competencies and competency frameworks. Stay tuned to HR Insider for announcements on how you can get involved and share your valuable knowledge and experience. On September 21, 2018, at a Delhi event that brought together key industry stakeholders, Dr. Sonali Sinha, COO representing the Tourism & Hospitality Skills Council (India), and Philip Mondor, President and CEO, Tourism HR Canada, signed memorandum of understanding (MOU) to establish a collaborative working relationship. This was the second such agreement formalized during a successful recent mission to India. The Tourism and Hospitality Skills Council (THSC) has a mandate similar to Tourism HR Canada. THSC is a not-for-profit organization established “by industry, for industry”. THSC is mandated to create a robust and sustainable ecosystem for skill development in the tourism and hospitality sector, comprised of hotels, tour operators, foodservice restaurants, facilities management, and cruise liners. THSC is contributing to the development of more than 3.3 million competent workers by 2022, through the setting of National Occupational Standards, conducting labour market research, accrediting training partners and vocational institutions, certifying trainers, and facilitating learner assessments and certifications. THSC and Tourism HR Canada anticipate opportunities to work on joint projects, such as setting international competencies/occupational standards and conducting research on learner and worker mobility. Watch for future developments as we pursue the opportunities presented by this new international agreement —stay informed by subscribing to Tourism HR Insider and get the latest delivered directly to your inbox. A fresh brand emphasizes the strengths and goals of a recently announced initiative funded by Immigration, Refugees and Citizenship Canada (IRCC). Destination Employment: Your Future Begins Here is the innovative pilot project coordinated by Tourism HR Canada and the Hotel Association of Canada to provide career opportunities to newcomers to Canada. It launches this year in accommodations businesses in five participating regions. With a national labour shortage stifling the growth of Canada’s tourism sector, it’s imperative to boost awareness of the many opportunities available in tourism and hospitality. Destination Employment will be part of our strategic pillar to make Canadian tourism a destination not just for visitors, but for employment. The project will highlight the diverse urban and rural regions in which tourism employment is key to economic growth, the wide variety of positions available in the accommodations industry, the many transferable skills that can be acquired working in tourism, and the possibilities for advancement available to those who hope to pursue a career. To that end, the brand uses the broader term “employment” to cover both jobs and careers. Many see tourism as offering jobs that are a part-time or temporary means to pay the bills. Those jobs absolutely exist and are a perfect fit for individuals who seek a flexible work arrangement while they pursue other goals. Some of them, however, may decide to join the many who’ve built a stable, well-paying career in a dynamic and booming economic driver. Hotels offer supervisory and managerial roles in all departments, and the career ladder can lead to a role as head of sales, HR, marketing, housekeeping, events, food and beverage, or the full operation. Companies with multiple properties also offer promotion to the corporate office, complete with the opportunity to work and travel across Canada—and beyond. Destination Employment will include positions at a range of levels of responsibility, encouraging newcomers to explore and establish a career in tourism. Destination Employment also seeks to showcase what participating employers and newcomers will gain. For employers: much-needed staff, who will participate in on-the-job training and add to the properties’ diversity through their experiences, cultures, and languages—boosting these businesses’ ability to welcome Canada’s increasingly international visitor mix. For newcomers: meaningful, stable, well-paying employment in an industry that values the skills they have brought on their journeys to Canada. Those offering employment and those seeking it will find the support and resources to help them reach their destination. Look for future announcements on how employers and newcomers in Yukon, Alberta, Saskatchewan, Ontario, and the Atlantic region can participate in a Destination Employment information session in upcoming editions of HR Insider—subscribe here to have it delivered to your inbox. Tourism HR Canada is proud to have been involved in this year’s successful Travel and Tourism Research Association (TTRA) conference, Propelling Smarter, Bolder Tourism, with our Labour Market Intelligence team exchanging ideas and experiences with other thought leaders from across Canada. Held September 26-28 at the Halifax Convention Centre, the event saw almost 100 academics and practitioners from the tourism research community discuss pressing issues with the conference’s keynote speakers, such as the rise of smart tourism, the effect of cannabis tourism, the LGBTQ tourism market, and how to conduct research and collect data while maintaining the privacy of those whose data you collect. Attendees also learned new techniques for turning their data into visuals that quickly communicate key insights to stakeholders. Tourism Nova Scotia led delegates on a tour of Halifax’s downtown, with stops at the Five Fishermen, Citadel Hill, and the Halifax waterfront. Despite a deluge of rain, spirits were not dampened as attendees learned about the impact of Nova Scotia’s EXCELLerator program, which helps entrepreneurs create compelling visitor experiences for the free-spirited traveller. The tour showcased Halifax’s wealth of visitor attractions while offering key insights on building the tourism experiences of the future. Tourism HR Canada would like to thank TTRA for its hard work putting together this year’s informative and engaging program. Look for future articles detailing how the conference’s topics will impact tourism businesses and employees—subscribe to Tourism HR Insider to get the latest delivered directly to your inbox. Next year’s TTRA Canada Conference will be held in Saskatoon, Saskatchewan, from September 18 to 20, 2019.